Preserving spicy, smoky salsa helps carry summer's flavors into fall and winter. Photo by Fran Hill. The heat of summer seemed unrelenting this year. Thermometers soared. Gardens wilted. People melted. Scorching might be the only polite description for those torrid days. And so it is with trepidation that I make my next statement. Give me a sunny 100-degree day over a breezy one in the 70s. It is amusing that the sweat I work up on the treadmill disgusts me, but I will willingly swelter with a book in a lawn chair under the blazing sun for hours. I believe the hotter the better for yard work and gardening. I love summer and all the heat that goes with it. With the official end of summer nearing, I find myself desperate to hold on to that blissful heat. I want the warmth. I need the fever of the sun. 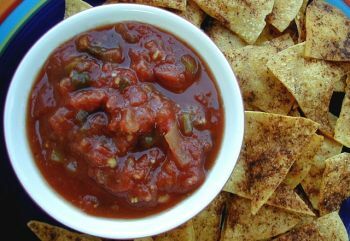 Salsa is one way I keep a grasp on the sunny season. I love the melding of sun-ripened tomatoes and spicy jalapenos on my tongue. I like the smokiness that almost comes across as heat in the back of my throat when I add a little cumin to the mix. It is so satisfying to chop and stir and simmer and process vegetables into beautiful jars of salsa to carry some of the wonderful summer heat into fall and winter. Combine all the ingredients in a large, heavy pot, bring to a boil and simmer for 45 minutes. Ladle into sterilized pint jars; seal. Process in a hot water bath for 20 minutes. (If you are unsure of the canning process, there are many informative sites online. I am not a canning authority.) Makes 5-6 pints.